– One of the awards was presented to Emanuela Zaimi from Albania. Emanuela is a mother of 3 children, the oldest one Arbi, a 7 years old boy was born with Down syndrome. Founder and CEO of Down Syndrome Albania Foundation. Board Member of European Down Syndrome Association and Member of the Albanian National Council for the Civil Society. Emanuela has graduated PR and Publicity, in Ankara University, in Turkey. She hold a Master Degree in “Creation and Development of SMEs in Transition Countries” and from September 2018, she will start a Master Program on “EU studies and EU project Management” In Burgenland University, in Austria. 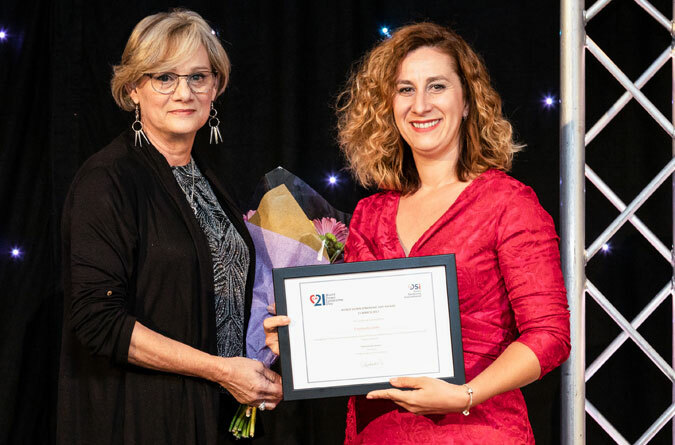 The Photo shows Vanessa dos Santos, president of DSi (left), presenting the award to Emanuela. In her speech Emanuela said: “I am deeply grateful to everyone who has a mark in the cause of people with Down syndrome in Albania. These five years of the existence of Down Syndrome Albania Foundation (DSA), have been both, a huge challenge and success for a newborn NGO like ours, in a country where there are a million problems and disability rights and needs are not a priority, due to the lack of knowledge, political will and lack of money. However, during these years, we managed to get everyone’s attention for our cause in Albania. Five years ago, little was known and talked about our children in Albania. Many parents too were shy or feeling ashamed or scared to show and talk about their child. It is a different story now, a better reality … I started this alone, but with the push of many other mothers. Today many of them are volunteers of DSA, sisters, and brothers too are and some of them are employees of DSA. We see the children of our center growing, developing, articulated and all are in mainstream kindergarten and schools. But, I will not be in peace until I see every child and adult with Down syndrome in Albania getting what their legitimate right is: acceptance in an inclusive community. I will not be in peace until I see that parents are not being worried anymore and asking the “one million dollar question – What will be with my child with Down syndrome when I will not be in this world?” I will not be in peace until I ensure a financial sustainability for our NGO. I need all this peace for my family as well. 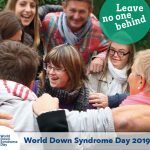 The World Down Syndrome Day Award from Down Syndrome International to me and my staff is a motivation to “Don’t Stay Calm, Keep Working” so the extra Chromosome feels safe and great in Albania, in Europe, and in the whole world. 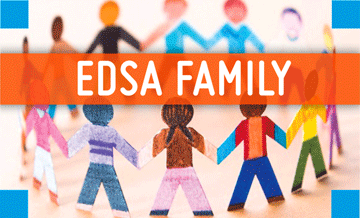 Thanks to all of the organizations that nominated me, most of which are from the EDSA family, where DSA belongs, although not an EU member country yet. 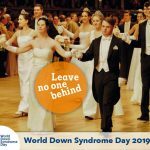 Agron Shehaj (Albania) – Agron is the owner of a company that has been making monthly donations to the Down Syndrome Albania Achievement and Development Centre for three years, which offers free therapy for 36 children with Down syndrome aged between 0 and 10 years. He has been instrumental in keeping this Centre in operation. Soela Zani (Albania) – Soela has had a long time association and been a volunteer of Down Syndrome Albania Foundation. Soela is a professional photographer and author of the project “Every Human is a Piece of Art”.